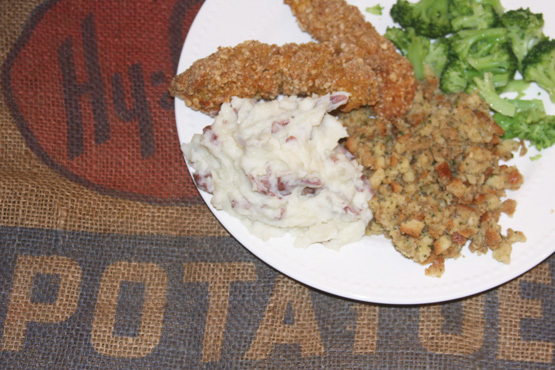 Those Thanksgiving staples at the dinner table are irreplaceable, and a great recipe for of those staples is something that you will make over and over again, not only for Thanksgiving, but all year round. This is a recipe that my whole extended family loves and it is a crowd pleaser no matter what the occasion. 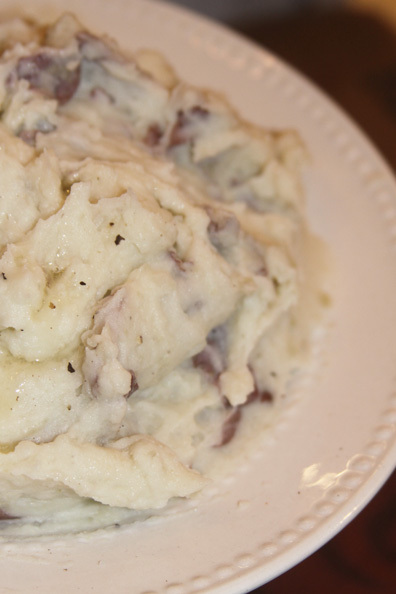 This twist on the normal mashed potatoe recipe has a few odd sounding ingredients but is packed with flavor. Red potatoes are the star of this dish, and save you time in the kitchen because it cuts out the peeling process. 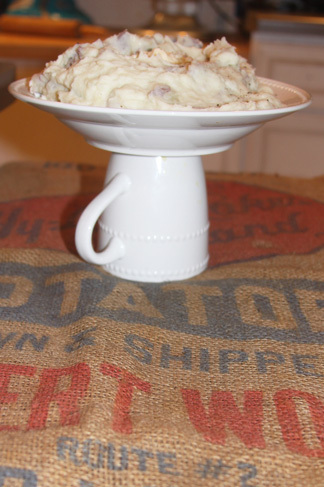 If you are in charge of bringing the mashed potatoes to this year Thanksgiving dinner this recipe is worth a try. It makes early morning preparation easy because there is no need to peel potatoes! Thanksgiving day is often super busy an hectic, especially for the cook in the family, and this is a great way to save some time on the prep work. Just wash , cut, and boil. 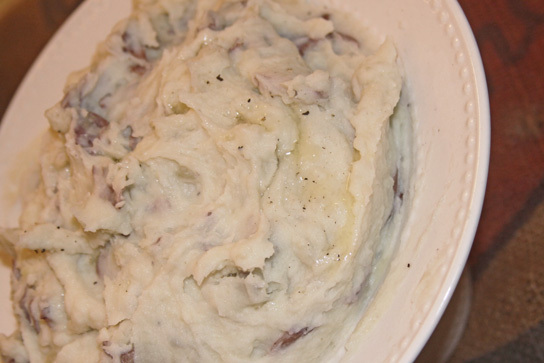 This is our families favorite go to mashed potato recipe. It is simple to make, and looks pretty on a plate. 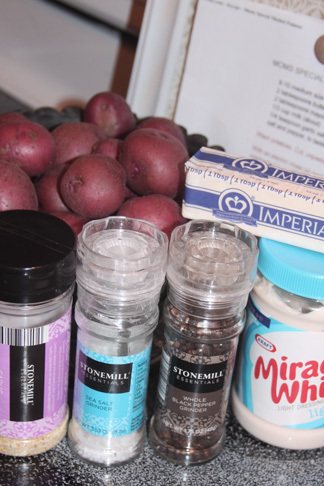 By adding Miracle Whip or Mayo and garlic salt to mashed red potatoes you are left with an out of this world plate of potatoes that is extra special. They have a great hearty flavor without being too off the wall different from the traditional mashed potato recipe. I usually make a double or quadruple batch to serve up at our large family Thanksgiving get together. After they are prepared I put them in the crock pot so that they stay fresh and warm while we travel the short distance to Grandma and Grandpa’s house. They are always a hit, and people are always surprised when I tell them the ingredients and how easy it is to make them. Not only is this a great recipe for Thanksgiving dinner, but we have it often on Sunday nights. If we are home for the day I love to have a warm homemade meal to feed our little family after a long day of working or playing outside. It pairs great with any kind meal that sticks to your ribs. I found the original recipe for these potatoes on Cooks.com. They were Submitted by: Tess Robins and named Mom’s Special Mashed Potatoes. Her recipe is so fantastic that I just had to share it. I tried a few versions of this recipe, but found hers to be right on. I do add a little extra butter, and also like to use Miracle Whip instead of Mayonnaise. If you like the taste of Mayo better in general, I definitely suggest you stick with that! Wash potatoes. Cut, unpeeled and boil until tender. 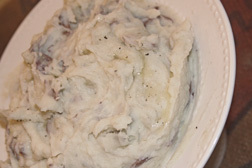 With an electric mixer on medium speed, mash potatoes. Do not overbeat. Add ingredients, beating until creamy. Add more milk if needed to get the correct consistency.